Coning habit at Cycad International, Katherine, Northern Territory, Australia. Origin and Habitat: Encephalartos ferox is a widespread species occurring on the coast of Mozambique (Maputo, Gaza, Inhambane and Sofala provinces) and the KwaZulu-Natal province of South Africa. Altitude range: Occurs at low elevations between 20 and 100 metres above sea level. Habitat and ecology: It grows on white beach sand of old beach dune systems immediately next to the ocean in closed evergreen coastal forest to dense shrubland. It also occurs in grassland areas, in forest margins and elsewhere not far from the coast. Its preferred habitat is very humid in the summer and rainfall amounts can range from 1000mm to 1250mm per year. The climate is more mild in the winter, and it is uncertain whether the species is ever exposed to frost. The plants are fire-tolerant and are relatively abundant where they occur. In nature the seeds are dispersed by mammals, such as monkeys and hornbills. 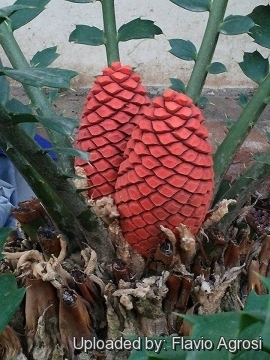 The cones of the Encephalartos genera produce heat just after sundown. Heat as well as aroma attract pollinators. The major threats affecting this species include over-collecting for ornamental purposes and habitat destruction due to current and future coastal developments and for agricultural purposes. Numerous plants have been removed and sold alongside roads in Mozambique and large tracts of habitat have been destroyed. 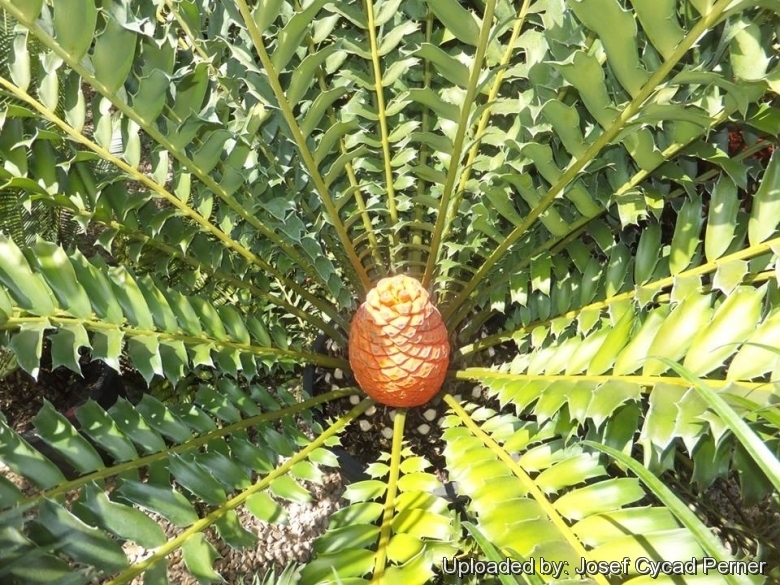 Description: Encephalartos ferox is small cycad with 35?cm wide soft textured subterranean trunk. It is morphologically very distinct, with hard-textured dull green leaves and broad leaflets with teeth all around. It gets its name from the Latin word ferocious, likely from the spine-tipped lobes on the leaves of the plant. 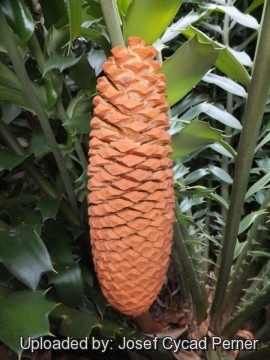 Male and female cones are borne on separate plants but individual plants can swap gender. E. ferox females add colour to the landscape with brilliant salmon-red cones. 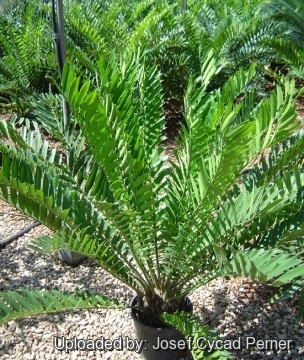 It is considered to be one of the most popular cultivated cycads. Trunk: Thick fusiform, unbranched or occasionally branched from base or suckering. Short often subterranean, majority less than 1 m tall or only rarely up 3 m high and 35 cm in diameter. Roots: Its roots contract due to the collapse of transverse sheets of cells in the cortex. It is thought that this contraction can help prevent seedlings from desiccation as they develop. Leaves (fronds): Several to many in a whorl, pinnately compound, 1-2 metres long including petiole 20-30 cm long and about 25 cm wide above the middle. Petiole and rhachis subcylindric. Rhachis nearly straight, erect spread?ing, at first tomentose, glabrescent except for pulvinus. Pinnules (leaflets) dark-green, firmly coriaceous, ovate-oblong, not at all falcate, mainly overlapping in the upper half, more spaced in lower half and diminishing in size towards the leaf-base, ultimately becoming bifurcated spines. Median leaflets 10-15(-20) cm long, 3-5(-7) cm wide, inserted at about 70? on the rhachis, flat or twisted, very oblique at the base and then rounded on the upper, narrow-cuneate on the lower edge, broadest towards apex, apex broad, pungently 2?4-spinescent, margin with 2?4 strong triangular diverging pungent teeth on either edge. Teeth are about 5 mm long on the lateral margins but appear longer apically. Young leaves are described as being hairy, and ranging from dark green to coppery brown in colour. 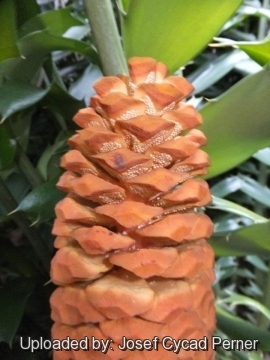 Male cone: Subcylindric, narrowed to both ends, up to about 40 cm long, 7-10 cm in diameter. Median cone-scales 3-4 cm long, 2-5-3 cm broad, 9-15 mm thick, ascending with the head deflexed; head triangular in outline with a hexagonal terminal facet. Males can have up to ten cones at one time. Female cone: Subsessile, on stout short peduncles, ovoid to ovate-oblong in outline, glabrous, bright salmon-red to red, about 25-50 cm long, 15-40 cm in diameter, solitary or sometimes up to 3(-5) in one crown. The cones also emerge in succession, rather than emerging simultaneously. Median cone-scales 5-7 cm long, glabrous, bulla 4-5-7 cm broad, 3-5-5-5 cm thick vertically, with lateral ridges extending into incurved lateral lobes almost to the main axis, upper and lower facets finely wrinkled in basal half, somewhat rugose on apical half, rounded, terminal facet slightly concave, 2-3 cm broad and about 2 cm wide vertically. Seeds; About 4.5-5 cm long, 1.5-2 cm broad, with outer coat bright vermilion-red becoming black and glossy, angled by compression, with fleshy beak, the fleshy part exceeding the stony inner part distally by about 2 cm. Chromosome number: The chromosome number in E. ferox, as well as other species of the genus Encephalartos for which chromosome number has been found, is 2n = 18. 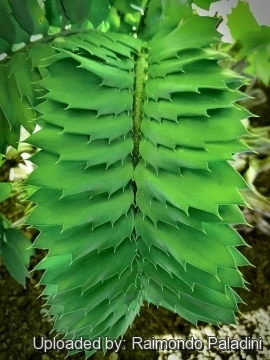 Similar species: As regards the bases and the marginal toothing of the leaf-pinnules this species resembles Encephalartos laurentianus and Encephalartos gratus. In this plant, however, the pinnules are much shorter relatively to their width and are nearly straight. From Encephalartos hildebrandtii, E. ferox differs in having much shorter and broader more coarsely toothed leaf-pinnules, and in having seeds with a black instead of vermilion outer coat. 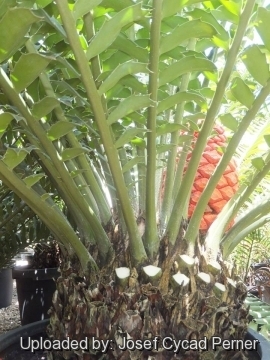 This species appears to stand apart from all others Encephalartos and has proved difficult to hybridize with any other species in cultivation. 10) Treutlein, J., Vorster, P., and M. Wink. "Molecular Relationships in Encephalartos (Zamiaceae, Cycadales) Based on Nucleotide Sequences of Nuclear ITS 1&2, Rbcl, and Genomic ISSR Fingerprinting." Plant Biology 7.1 (2005): 79-90. 11) Vorster, P., Van Der Bank, F. H., Van Der Bank, M. and M. Wink. "Phylogeny of Encephalartos: Some Eastern Cape Species." The Botanical Review 70.2 (2004): 250-259. 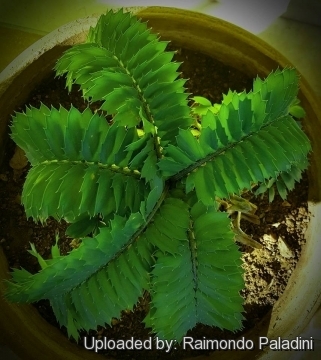 Cultivation and Propagation: Encephalartos ferox is an adaptable plant well suited to warm temperate and subtropical climates. It is moisture-tolerant like most South African cycads. It can also be grown in full sun without its leaves burning. Its beauty and ease of horticulture make it one of the finest cycads for use in the garden. 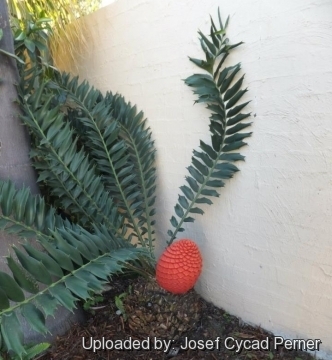 As a garden plant, this cycad will usually hold one or two crowns of leaves, all in good condition..
Growth rate: E. ferox is reported to grow relatively fast compared to members of other cycad genera, but are considered slow-growing when compared to other orders and classes, and takes 15 to 20 years for one of these to produce a cone, so patience is a must. Soils: It prefer well drained, sandy or gritty soil. Exposure: It thrives and grows best in partial shade, but tolerate full sun too. Traditional uses: The trunk of E. ferox has been used by local people for its starch content it yields a kind of flour used as food. The black seeds are not edible. Hardiness: It should be kept totally dry in winter at or around 10?C, but it demonstrates a remarkable degree of cold resistance and may tolerate light frost for short periods if dry.